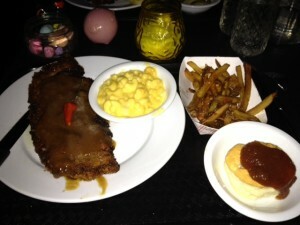 I was really excited when I heard about M3; The more Southern soul food in Boston, the better. It opened in June and The Globe just gave it a mildly positive review this week, so I wasn’t surprised that at 7:30pm on Saturday night there was an hour wait for a table for 2. The evening was warm and there were seats outside, so we decided to wait it out. 40 minutes later we were seated in the small, dimly lit dining room, listening to an all country soundtrack, which Steve appreciated. M3 refers to a common Southern meal concept that includes a choice of a meat and 3 sides. I love sides; sometimes I think that sides are better that the main course, and M3 has a ton of choices: root vegetable hash, mac and cheese, corn, grits, Brussels sprouts, 2 types of fries, sweet potato casseroles, salad, house pickles, fired okra, coleslaw, peach cornbread and biscuits with apple butter. I was shocked that there were no mashed potatoes or collard greens, staples of any southern meal. The menu is small, but there were many options that appealed to me; fried chicken, pork chops, country fried steak, pan fried catfish. Luckily for me, Steve wanted fried chicken for himself, so I was able to indulge in my ongoing search for Boston’s best country fried steak (CFS). He chose corn on the cob, Brussels and garlic dill pickles and I got the biscuit (big surprise), mac and chesse, and lime chili fries. The fry station fell asleep on the job – both the chicken the CFS were 2 shades darker than they should have been, another minute and both would have been burnt beyond eating. That said, the result was an extremely crispy exterior, and not at all greasy. I stole a drumstick from Steve and although the meat was moist, it lacked flavor. The CFS suffered from the same problem. 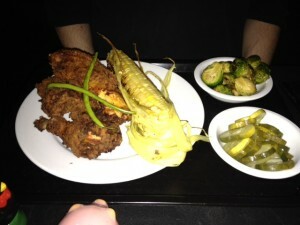 The sides were a mixed bag – the house pickles were the best of the brunch. They were crunchy, tart, garlicky a much needed foil to all the fried food. The sprouts were also well cooked and seasoned. My mac and cheese was swimming in Velveeta colored cheese sauce, but that didn’t stop me from finishing it. The fries were drenched in chili sauce, rendering half of them soggy and inedible. The kitchen left some of the husk on the corn, which made it messy and unwieldy. I didn’t try it, but Steve seemed to like it. Lastly, the biscuit was small and reminded me of the biscuit-in-a-can you buy the dairy aisle. I think I need to go back to Sweet Cheeks for another one of their excellent biscuits. There are only 3 beers on tap – the rest are in cans. I don’t think I’ve ever seen Steve drink beer in a can, but he said he liked both his selections. 2 out of 3 dessert options were fried, so we decided to go to Christina’s for ice cream instead. Our waitress was friendly and unobtrusive. And the prices are quite reasonable – entrees are between $16-18, which is a good deal when you consider the 3 sides that come with it. But, at the end of the day, I think that Highland Kitchen is doing better Southern food, for the same price, so why bother waiting an hour for a table?